Indonesia is a big country. Despite spending 8 weeks there across two different trips, I can’t say I’ve even covered half of it. This page does not pretend to be an exhaustive guide to all of Indonesia, though hopefully, it can help you learn about the different islands you can visit. Many people visiting Indonesia go to one place only: the island of Bali. While super touristy, many parts of Bali can still be genuinely enchanting, particularly if you leave the southern beaches and head inland. Of course, there is also much more to Indonesia than just Bali. Just glance at a map and you will immediately notice how huge Indonesia is. The island chain actually spans an area wider than the United States, so you might well be scratching your head as to where to go. There are some population centres here, but mostly it’s rainforests, farmland, and national parks here. If you’re on a regional Southeast Asia trip it’s certainly possible to travel overland through Sumatra, following a route from Singapore to Jakarta or vice versa. But relatively few do this due to the long distances involved, the points of interest being quite spread apart, and having to transit through an unappealing city like Medan. If overlanding seems like a lot of work, it may be tempting just of fly in. That said, Lake Toba, the world’s largest volcanic lake, is the main travel hub here—it is in the north near Medan. Sumatra is also a great place for going on trekking tours and seeing Urang Utangs in the (semi)wild, for which Bukit Lawang is a popular location. 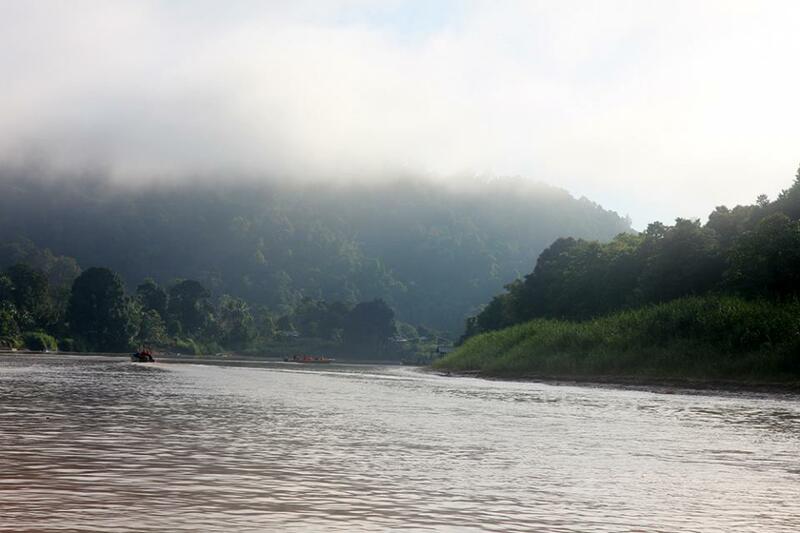 My own experience with Sumatra is limited, though I’ve heard particularly good things about the trekking and wildlife. Sumatra has an unspoiled feel, with relatively few tourists. This is Indonesia’s main island and home of its capital city. Expect the atmosphere of Java to be very different from the rest of Indonesia. The first thing you will notice is that it’s very crowded here, as much of the population is concentrated in this part. Jakarta is one of the most congested cities in the world; chaotic and hard to navigate, expect your transportation here to easily take twice as long as scheduled. Many opt to skip Jakarta to save the headaches. Java gets far more interesting as you leave the capital behind. Java has many points of interest. 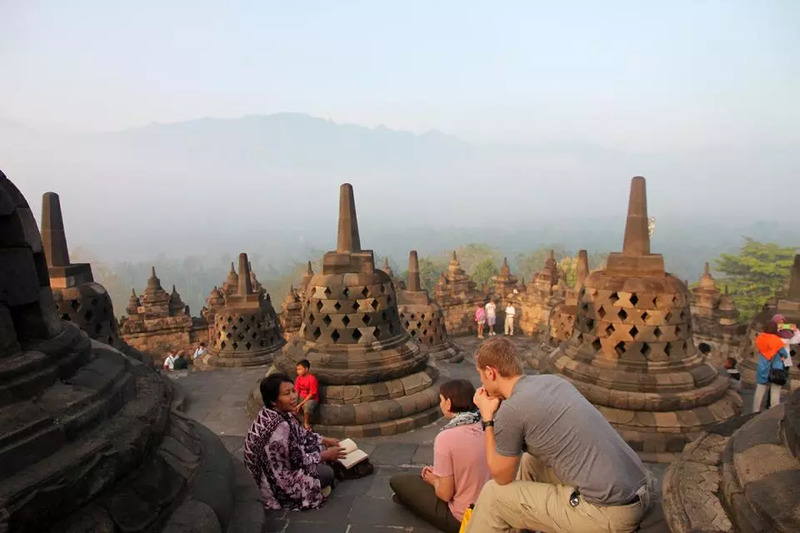 Most famously, it’s home to Borobodur, the largest Buddhist temple in the world. The nearby city of Yogjakarta is a cultural hub and a good base from which to visit Borobudur as well as other temples like Prambanan. 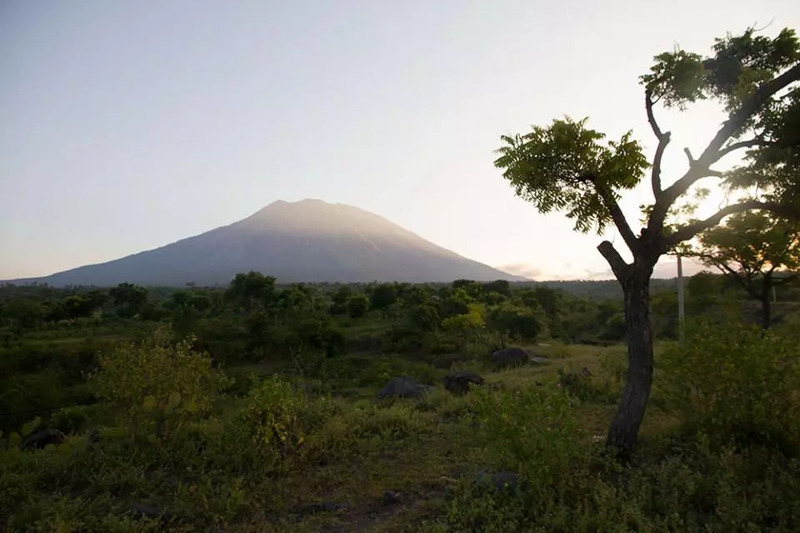 As you go further east on Java, you’ve got some incredible volcanos, such as the still-active Mt. Bromo (a spectacular sight especially at sunrise) and the blue-flame spewing Ijen volcano, where you can go right into its sulphur-spewing crater. 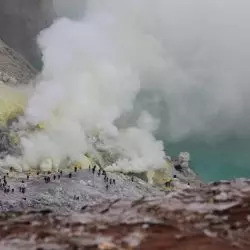 Both these volcanos are popular sights, usually reached by either a short walk or a 4×4 ride—if you want more of a trekking experience you should look specifically into a trekking trip to Mount Bromo, or consider climbing Mount Rinjani on Lombok. Many tourist sites around Java will be crowded with domestic tourists, including large groups of school children who may shower you with attention. They’ll want to take pictures or to practice English with you, and while this can be fun initially it can also get annoying quickly. Try to visit the popular tourist sites early in the morning to avoid being trailed by groups of overexcited teenage fans. Maybe that makes me sound like a sourpuss who doesn’t want to engage with the locals, but you’ll know what I mean when you get there! Since Java is heavily populated and busier, it can be nice to put some quiet places in your itinerary. For example, I stayed an extra day in a small village near Mount Bromo, and spent the day just walking around the area (where I was constantly greeted by friendly locals) and having a nice bath in a volcanic thermal spa. This gave a wonderful break from the hustle and bustle of Java’s cities and the crowds that gather at all the famous temples and viewpoints around the volcanoes. Java is a fascinating part of Indonesia, but I also think it’s best enjoyed in combination with the relative calm of the other islands. After all the buzz and excitement, it’s nice to have a break. Bali is Indonesia’s main tourist destination. Here the vibe ranges widely from crass commercialism in Kuta, the main tourist area in the city of Denpasar, to pleasant and authentic further inland. Kuta is a lot of things. To some Australians, it’s just a cheap place to drink yourself silly, and some do come here just for the weekend to go clubbing or boozing. There are backpackers too, as well as plenty of families on a holiday. It’s a bit of a congested maze of little streets and alleyways… with a mix of hostels, hotels, spas, tacky souvenir shops, scooter rentals, Western brand stores, McDonald’s, Starbucks, a Hard Rock cafe, and a whole lot more. You might find a nice local Indonesian warung tucked away somewhere, but it’s equally easy to have German schnitzel in a tacky tourist restaurant. On Kuta’s fringes, there are many high rise hotels along a (mostly disappointing) beach. As you can maybe tell, I’m not a big fan of Kuta. Besides the Australian binge drinking or fly-and-flop holiday crowd, Bali also attracts an older and gentler tour crowd especially around the inland village of Ubud, a place incidentally made famous by the movie Eat Pray Love. While Ubud is pretty touristy, I find it is pleasantly so. There are many beautiful temples to visit in and around Ubud, the tourist shops sell genuinely impressive handicrafts and local art, and the surrounding hills are wonderful for an afternoon hike. 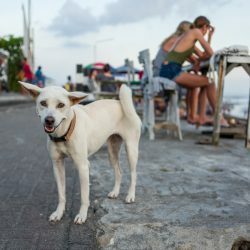 Ubud also makes for a great central base from which to explore other parts of Bali, so if Kuta is not to your liking, you should try your chances in Ubud. 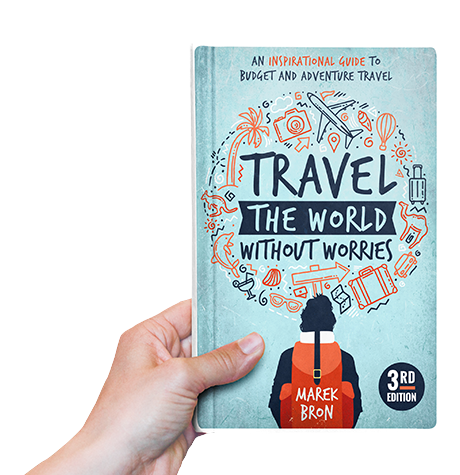 While Bali can be pricey in its most touristy parts, you can still easily travel there on a backpacker budget. Read how to travel in Bali for under $25 a day. You can also find some great information here on backpacking in Bali. I think Bali truly shines inland. Consider renting a scooter so you can enjoy the wonderful rice terrace landscapes or visit temples at your own pace. Bali is also a great place for more active pursuits – there’s some amazing scuba diving in Amed and Nusa Lembongan, and you can go white water rafting and canyoning in central Bali as well. Along the north and northeast coast many of the beaches have dark volcanic pebbles instead of powdery white sand, which means fewer people visit these parts… but that’s precisely what makes them great. Consider visiting the small fishing villages of Lovina and Amed, or take a boat to the small island of Nusa Lembongan. A popular activity in Lovina is to head out on a small boat for some dolphin spotting. If you’re a scuba diver, I hugely recommend Amed/Talumben. This small town is right next to the wreck of the USAT Liberty, which once stranded relatively close to shore. You can literally walk from your dive shop into the sea, and then slowly descent from the shores right down to the wreck. Since no boat ride is required, dives cost very little. It’s a perfect place for getting your certification as well, and I saw prices cheaper than on Koh Tao, Thailand. Lombok is right next door to Bali, just a 2,5-hour boat ride away. It doesn’t have all the cute little houses and Hindu shrines that you find on Bali, and to some it might be lacking a sense of honeymoon romance. Lombok is a bit less explored and you might say a bit more rugged, but that also makes it a great place to go for something a bit different. 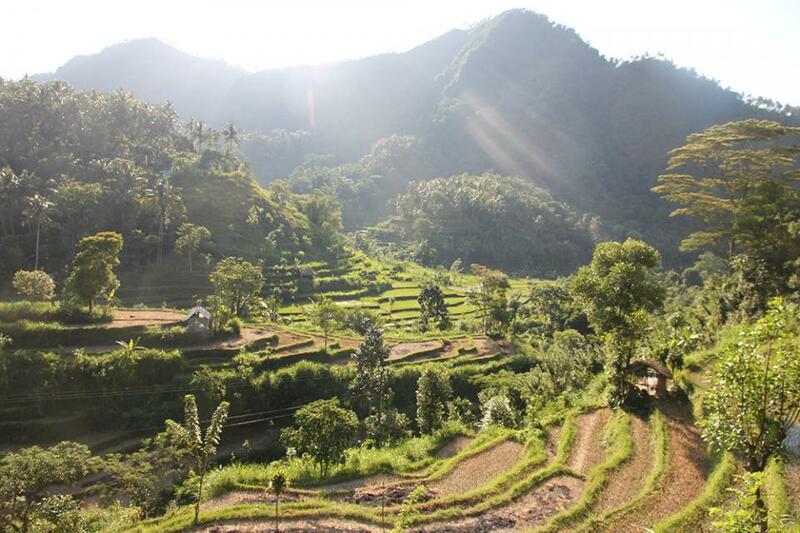 The main attraction is Mount Rinjani, a volcano that you can hike up to as part of many multi-day trekking tours. The various waterfalls, villages, etc. around the island are also well worth exploring. Kuta on Lombok (not to be confused with Kuta on Bali) is a small and low-key surfer town that’s fun to visit as well. 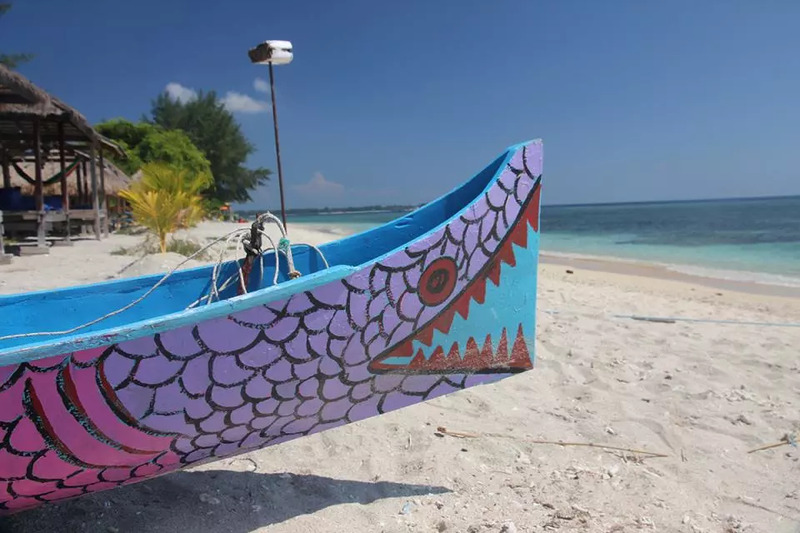 But the biggest magnet for visitors to Lombok are the Gili Islands, a group of three islands that have long been a backpacker favourite (although they’ve been going more upscale in recent years). The biggest island, Gili Trawangan, is also the busiest. Trawangan sees an odd mix of tourists, ranging from backpackers to couples on holiday, to luxury tourists and maybe a corporate retreat or two in the handful of resorts. While only foot traffic and horse-drawn carriages are allowed on the island, it can be very busy along the main strip, not to mention there’s constant honking from passing horse carriages. For much quieter spots, rent a bicycle and go to the far side of the island. 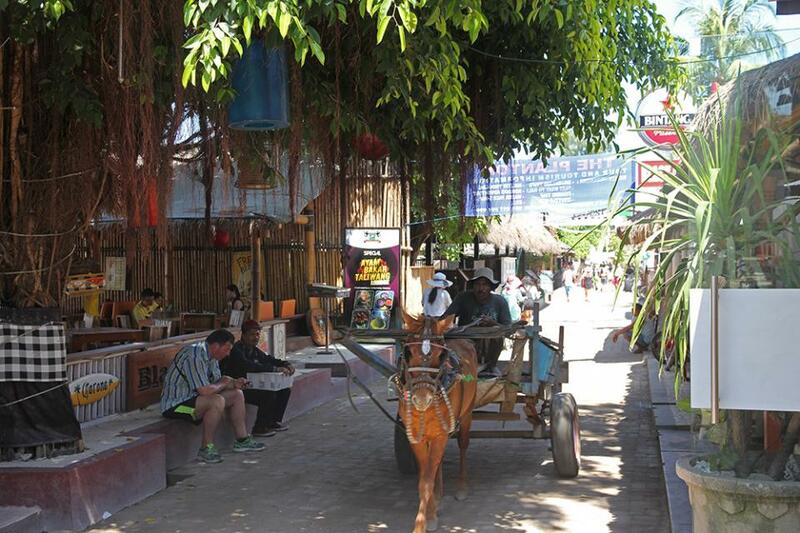 While not exactly 100% tranquil, Gili Trawangan has a lot to do and a fun bar scene as well. It’s sometimes referred to as a “party island”, but I think that creates the wrong image. It’s maybe better to say that it’s “an island where you can party”. The reggae bar Sama Sama has some live music almost every night, and there are several other bar parties regularly throughout the week. Before sunset, many people gather for friendly drinks at the Sunset Bar where there might be drums or fire dancers. La Boheme is one of the best hostels on Gili Trawangan: go here to meet people. At night, there are friendly social drinks here, as opposed to the much more boozy Gili Hostel. The all-day pancake making station is also much appreciated. For a more relaxing time,head to neighbouring Gili Meno or Gili Air. There aren’t as many people here, and the slow pace will feel like a breath of fresh air. Anything you can do on Trawangan (scuba diving, snorkelling, yoga, bike rental, etc.) you can also do on Gili Air, just don’t look for a big night out. I went to the Gili Islands twice, and it was pretty trippy to come back to it two years later. It felt so much had changed… but was that only in my memories? 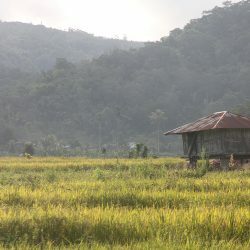 Flores to me felt very much like an up-and-coming addition to the backpacker trail—tourism still seems in its infancy but you could easily see it becoming more popular in the future. Some people only go to Labuan Bajo (taking a flight from Lombok or Bali), as this town is right next to the Komodo National Park, Flores’ main attraction. But it’s also very much worth going further east from Labuan Bajo and exploring Flores itself. I wrote a more detailed guide to Komodo and Flores, but will also give you the gist here. Flores gets increasingly remote as you go east. Go this way if you don’t need everything handed to you on a platter and enjoy travelling just for the immersive experience. 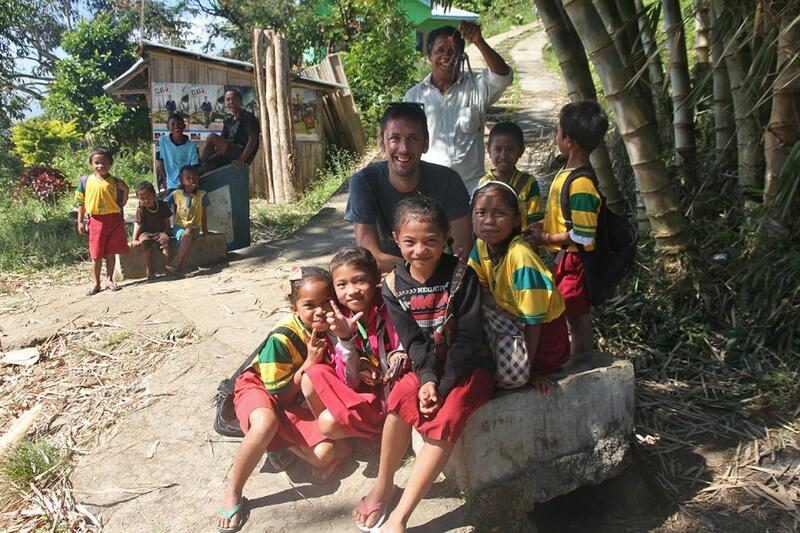 I loved exploring Flores by motorbike as all the kids from the villages will be excited to see a foreigner and come out to high-five you, and rice farmers will be waving at you all along the way. 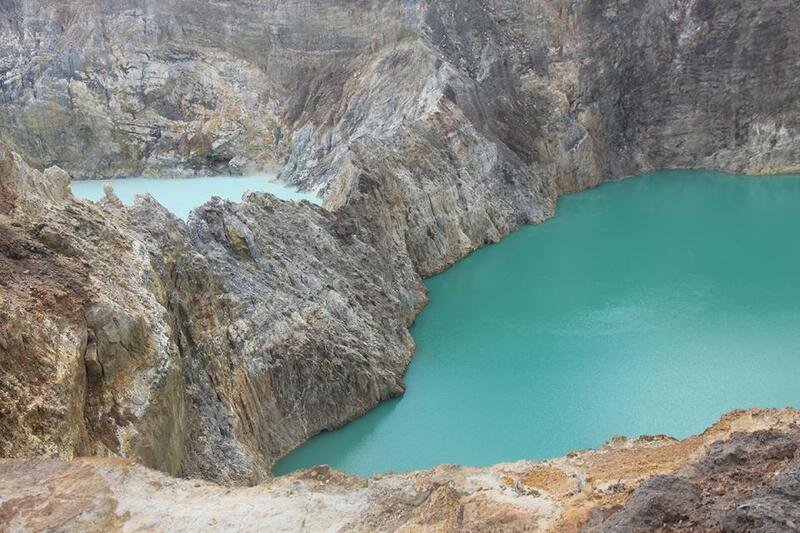 There are some traditional villages you can visit on Flores, and the multi-coloured volcano lakes of Kelimutu are worth a look as well (though you’ll be dropped off at a parking space with visitor center 10 minutes from the craters—for a true volcano hike go to Rinjani on Lombok, or elsewhere). There are some tourist sights, but Flores is mostly about going somewhere relatively low-key and just enjoying the journey. As you can probably tell, I liked it a lot. Flores and the Komodo Islands, as well as my 3-day boat journey there starting from Lombok, were among the best things I’ve done in Indonesia. Borneo is home to vast stretches of untouched rainforest, although much of it is also disappearing because of palm oil production. I did not go to the Indonesian part of Borneo as I only visited the more easily accessible Malaysian side. However, from visiting Borneo generally I can confirm that with the right guide it’s possible to see a ton of incredible wildlife including various species of monkeys, tropical birds, crocodiles, etc. Sulawesi is the one place I wished to have also gone last time I was in Indonesia, but I didn’t have time before my visa ran out! It’s high on the list for when I return in the future. It’s mainly known for its many traditional ceremonies that still take place here. 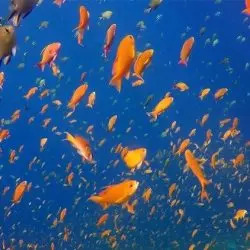 There are some key scuba diving destinations particularly in the north, though these tend to cater to more high-spending divers than the casual enthusiast. For the budget-conscious diver, I’ve heard nice things about Bira Dive Camp, a backpacker scuba diving on its southern coast. These are remote, lacking tourist infrastructure, or sometimes just lacking in infrastructure period. Relatively few people go to these parts, though I’ve heard whispers of wonderfully hidden islands and undiscovered beaches on the Malukus in particular. There is some limited tourism on Papua, though prices for things like accommodation are higher than elsewhere—beware of this if travelling on a budget. Exploring Papua itself may require a special permit beyond just your standard visa; be sure to check the current regulations. Indonesia is inexpensive, though there are some exceptions. Southern Bali with its luxury hotels and resorts can be very pricey, as are (maybe counterintuitively) the most remote places like Papua. While Indonesia used to be known as the region’s ultimate cheapie, it is now actually a bit more expensive than mainland Southeast Asia. Note that various park entrance fees have been increased a lot in recent years—for more information, check out my Southeast Asia Cost of Travel Overview. Above: population density in Indonesia. Java can be chaotic and busy, while there is seemingly barely anyone in Nusa Tenggara. I found this map helpful in visualising what to expect. Have you ever travelled to Indonesia during rainy season? I will be traveling southeast asia in November/ December, and somehow I really set my mind on Indonesia, but because of the climate I am not sure if it makes any sense and if it would be smarter to go to Vietnam instead. Hiya, I was wondering how you travelled from Yogyakarta to Mt. Bromo? Was it by bus or train? Thank you!! Thank you! One more q if that’s okay… if I want to take the train from Jakarta go Yogyakarta is it advisable to book in advance or can I buy a ticket the day before? Ps I have just bought your book – looking forward to the read! Great article, thank you for sharing. I completely fell in love with Sumatra, which is a bit off the beaten track. Not only Lake Toba and exploring the jungle of Gunung Leuser National Park is amazing, but island hopping at the Banyak-islands and Pulau Nias, which is like paradise on earth and has a lot of culture to offer. Pulau Weh is definitely one of the best dive spots in the world and the atmosphere is just so relaxing. Had a lovely trip with Orang 2 Utan (www.orang2utan.com) which help organizing trips, collaborate with one of the most experienced guides, but also are just open for tips on accommodations and how to get around..
All in all Indonesia is a beautiful and very diverse country. Hi, what town did you stay in near mount bromo in java? I would love to back pack! I only have up to 5 weeks end of july to august. Is it advisable/possible to travel this way with a child(8)? Hi ! i am presently 17 i would like to go on a one month trip in indonesia, i am wondering if there would be problem for renting scooters ( i have my canadian driver liscence ) and for renting hotels thanks ! in Indonesia July 1st…..thanks for this! Hi! Great post! I’m going to Indonesia for one month soon and still planning where to go. I thought I would start in Java and be there for around a week. Then I thought I would head to Bali, but haven’t decided how much time would I spend there and if I will go to Gili Islands&Lombok or to Flores. I really like places with no tourists but would like to meet some other backpackers as well. I’m not really into partying either. I would also like to do some activities and I would love to go scuba diving for the first time (or get a certificate for that?). I think I will fly to Jakarta and fly back home from Bali. Do you have any tips on how to decide which islands would suite me best? Hey Sofia. Great question! The Gili islands are quite party focused so maybe Lombok or Flores will give you more of what you want. These places are less popular than Bali or the Gilis, but you’re not going to be totally alone there either. The reefs around the Gilis are fine for a first scuba diving experience but the USS Liberty wreck on Bali or the island of Nusa Lembongan are a bit more special. If you have 2 or 3 days (and some money) to spare I can highly recommend getting Open Water certified. Some dive shops offer ‘taster’ dives but these are pretty limited experiences. I just came back from a month of backpacking in Java and Bali and I can say Indonesia is definitely one of the most beautiful destinations I have ever been too (and very cheap). Very good article! 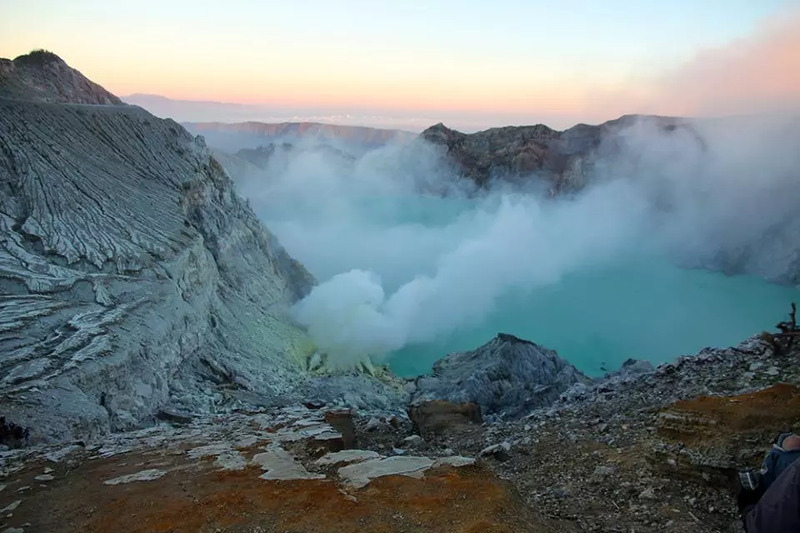 Thanks for the tips, I definitely want to get to Ijen Crater and Tana Toraja some time next year! Very good article. I am an Indonesian myself but still struggling to complete one of my dreams: visit all Indonesian provinces before I get 25. In general, traveling is not Indonesian culture, except those like Minangkabau people form West Sumatra that migrate to most parts of Indonesia. Indonesia is really huge, with 260 millions people, 17,000 islands and culturally diverse (yet is not equally distributed) population. It has about 450 ethnic groups and 719 living languages. 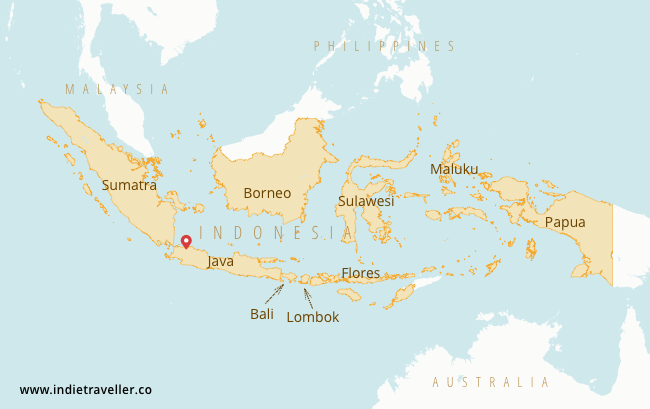 Javanese is the largest ethnic and L1, taking 42% of total population (btw, I am a Javanese too) but the national language is Indonesian, which is standardized form of Malay, whose ethnic only take 3% from national population. If you are Indonesian nor live here in Indonesia for long time, you could easily find that Indonesia is MUCH MORE than just Bali. 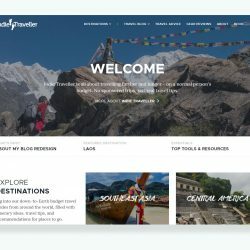 Just a small tips, learn Indonesian if you want to find better tourism information (especially for those outside Java and the Lesser Sunda Islands) in the net. With little (Indonesian) web-researching modals, I have visited many wonderful beaches, from white sand to pink-colored to rocky ones, from peaceful and quiet beach to the one that have huge surfing waves. I visit some traditional settlements inland, it is simply charming to see their way of live. There are some hidden natural paradise in the remotest place, such as waterfalls in Sumatra or snow-covered peaks in Papua! For the last, it is still on my wishlist. I never visited Maluku and Papua. Even before that, Indonesia is still TOO HUGE to be explored completely. Anyway, I reside in Palembang, South Sumatra, so do not hesitate to contact me (masjawad99@gmail.com) if you need tourism or other activities information in the South Sumatra area (which include the provinces of South Sumatra, Jambi, Bengkulu, Bangka-Belitung, and Lampung). Very little tourism activity done here, yet it has many exciting places of interest (beaches of Lampung and Bangka-Belitung, inter-provincial UNESCO World Heritage site natural reserves, wetlands to watch bird migrations, to old archaeological sites (Muarojambi Temple Compuonds with about 20 temples!) and scattered Stone Age monuments. I have traveled the area since my childhood, but even after that, my wishlist still contains many places in this area. Just wanted to say how helpful this was for me. i’m in Bali right now trying to decide if I spend my next week here or explore more. Thanks for all the info! Has anyone ever visited in November? I know it is the wet season but I was wondering if tis till a good time to go or if I am better spending November in the Philippines? Any advice would really be appreciated. Great article thanks, I’m heading to Indonesia on the 16th Oct so your advice is appreciated. I agree with the comment as to avoid Thailand in the wet season, because I’m here in Koh Lanta and it’s very, very quiet and very wet. I have September and October to work with. To avoid bad weather I was considering starting in Indonesia for one month and then backpacking Thailand for one month. What do you think about that plan? 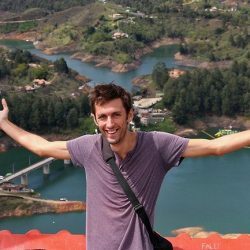 Is Indonesia a good start for going alone backpacking? Yes it can be a good start. If you want to travel solo and also meet people, you could start on Bali where there are many other travellers. Our favorite part of traveling Indonesia was crossing Flores, it still felt so untouched… a great way to do it is to fly into Maumere and hire a local to drive you one way to Labuanbajo and fly out from there.